Aston Martin has released a teaser previewing a new concept from its revived luxury brand Lagonda, ahead of its full reveal at the 2019 Geneva Motor Show on March 5. 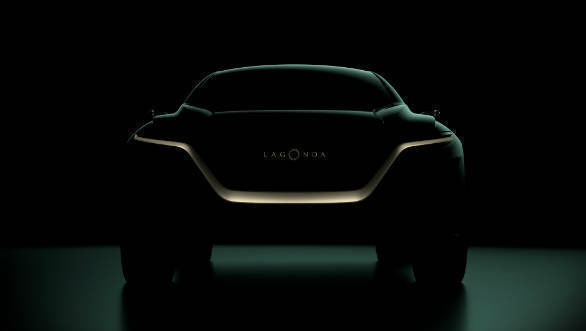 This will become the brand's first model, an SUV, and is called the Lagonda All-Terrain Concept. This will launch before the Lagonda Sedan and will feature a similar all-electric drivetrain. The production-version of the All-Terrain concept will be manufactured alongside the new Aston Martin DBX SUV in Wales. There are no details yet on the All Terrain Concept's power outputs but acceleration times should match or better those of the current Aston cars. So expect a 0 to 100kmph time around 3s and a top speed of around 250kmph. There will be an underfloor battery pack and all-wheel drive, we think the range will be around the 400km mark. The teaser reveals minimal details of the new EV SUV's styling. It is evident though that the All-Terrain will carry the signature gold handlebar style motif on the front. The bonnet looks heavily contour. Also, the windscreen seems heavily raked and the SUV's beltline is quite high up, in the manner of other such sporty SUVs. In its heyday, the Lagonda brand was notable for its luxurious offering and the All-Terrain Concept should carry forward that legacy. The new SUV should be a more road-focussed and sportier competitor to cars like the Roll-Royce Cullinan and Bentley Bentayga but with the distinction of being all-electric.